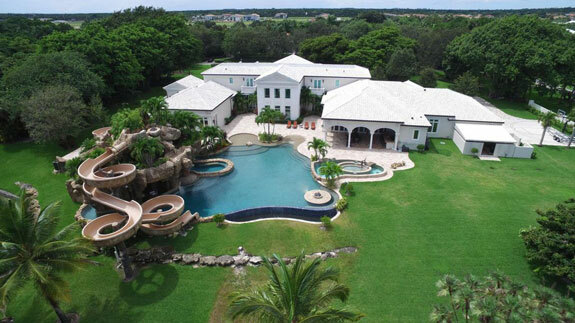 A Boca Raton mansion with some truly unbelievably splash, slide and water play features including a lazy river, 2 waterslides, waterfall, infinity pool, Jacuzzi in wonderful sunny south Florida offers eight bedrooms and nine-and-a-half bathrooms, 11,000 square feet of living area, 4-car garage, a basketball court, has hit the market asking $7.95 million. The whole complex is surrounded by gorgeous 6.5 acres. Call Susan Penn for more information at 954-557-5993.